Carly and James loved the Las Vegas Passport Invitations I created for Kelly and Mathew but had a different colour scheme in mind. 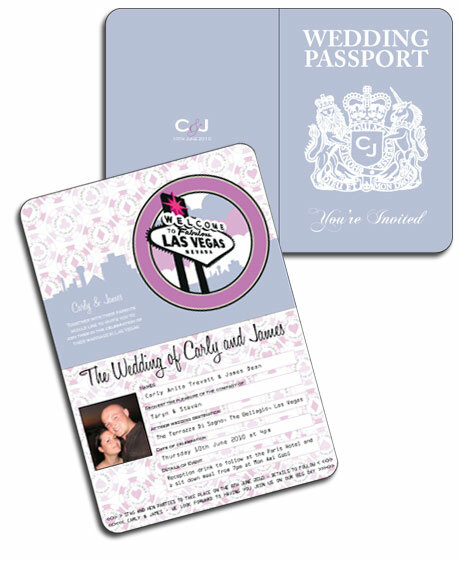 These Passports are a great way to let your guests know about your Las Vegas Wedding. They can be customised to suit any colour scheme, see a black, red and white version here. The poker chips in the background are also customised with your names and wedding date. The Lilac and Pink colour scheme worked really well on these invites and they also opted for the standard 4 sided invitations rather than having a tear off RSVP. This is a good solution to keep costs down if you're working to a smaller budget. All of my designs can be redesigned to suit any type of passport invitation you need. If you want the tear off RSVP or perhaps extra pages to include additional information for your guests it's not a problem. Just to let you know we received the invites yesterday and they are fabulous!! We are so pleased with them, they were even better than we imagined! Can't wait to post them out now! Thank you for your help and we will definitely recommend your company to others! Carly and Jim were a lovely couple to work with and I thoroughly enjoyed creating their Las Vegas Passport Invitations. When they initially contacted me they liked the design I had already created in Black, White and Red but weren't sure it would match their colour scheme. I posted out a printed sample of Matthew and Kellys design so they could see the finished quality and explained that all my designs can be created in any colour scheme. That meant I could create Carly and Jims design in the exact shade of Lilac they were looking for. If you're not sure how to explain the shade or colour you'd like for your stationery why not have a look at www.ColourLovers.com, it's a great site and I use it nearly every day. Not only does it list colours there's also a handy palette search option which shows you examples of lovely colours which work well together. If you've seen an example of a design you like on my site but want to check it will work in another colour combination just drop me a message using the form below and I'll get back to you as quickly as I can.